SHANGHAI - The two top shareholders of a real estate firm responsible for developing the Lotus Riverside residential complex, where a nearly complete building fell to its side last year, were sentenced to life in prison on Wednesday. 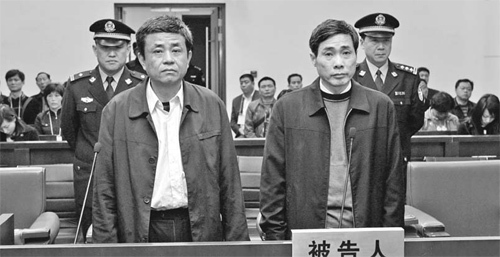 The Shanghai No 1 Intermediate People's Court convicted 52-year-old Que Jingde, the second largest shareholder of the Shanghai Meidu Real Estate, on one charge of graft, while finding Zhang Zhiqin, 51, the largest shareholder in the firm, guilty on counts of graft, embezzlement of corporate funds and causing a serious accident. Zhang's personal assets worth 5 million yuan and Que's 2 million yuan were also ordered to be confiscated. On June 27 last year, a 13-story building in the Lotus Riverside residential complex, located in the suburban Minhang district, fell to its side, almost intact, killing one worker, who had finished his work for the day but had returned to the structure to collect his tools. Subsequent investigations revealed the building collapsed as the foundation of the structure was undermined due to a combination of excavated soil piled 10 meters high on one side and the digging of a 4.6-meter-deep underground car garage on the other. Zhang had allowed an unqualified contractor to build the underground car garage in November 2008. Zhang and Que embezzled more than 40 million yuan in company funds from September 2000 to April 2001, the prosecution said. Zhang also mishandled 440 million yuan of company funds to invest in financial products for personal gain.